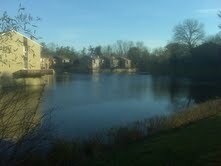 This is a "lake" I frequently run past in a planned community near me. Somewhere at the bottom of this body of water, gollum clutches my loyal, stay-at-home-dad friend's wedding ring - tossed in there after his successful, narcissistic, neurologist wife began an affair with a 20-something year old (dubbed "50 cent" by my friend). I'm in a phase of life when people are getting divorced left and right... Anyone know that phase? The first mile is really tough, but after I hit mile 2, I wouldn't quite call it the sought-after "runner's high", but I definitely feel energized, like I could just go for miles and miles. Amazing job on the run! You're doing great! No telling how many secrets the lake holds. lovely looking lake but sad use for it. I have several friends who have been too scared to split up, even though they don't seem so happy. I don't know which is worse in that sort of case - staying or splitting up. Running sounds really important and satisfying for learning and reflecting. Good for you, running like you are. I used to run a lot when I was younger. Beautiful lake too bad it has such a negative connotation. Hopefully your friend will find true love soon. Have a great weekend.